Immigrant-rights advocates say that Vargas’s release is proof that resistance works. Faced with the nationwide outcry following its arrest of an undocumented DREAMer, the Trump administration has relented. On Friday, Daniela Vargas, a 22-year-old undocumented immigrant from Mississippi who was arrested by immigration officials after publicly speaking out about a raid on her family’s home, was released by immigration officials. She had been held in immigration detention since her arrest on March 1. 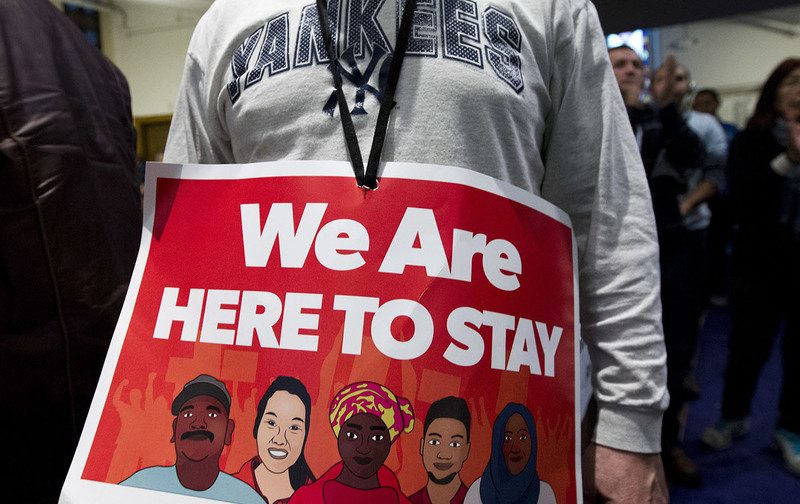 “Today shows you what happens when a brave young woman stands up and expresses her rights and fights back,” said Karen Tumlin, legal director for the National Immigration Law Center. NILC, together with the Southern Poverty Law Center and Vargas’s attorneys at the law firm Elmore & Peterson, coordinated legal strategy to win Vargas’s release. Her case garnered passionate national attention, and not just because Vargas is, as some young undocumented immigrants are known, a DREAMer. The particulars of her arrest were uniquely troubling. Nine days ago Vargas had just finished participating in a press conference about the Trump administration’s immigration enforcement when immigration agents took her into custody. She was a passenger in a friend’s car and the agents reportedly told her that they knew who was was, and that she ought to know why they’d pulled her over. But the reason that Vargas was speaking out publicly at all was because immigration agents had raided her family’s home. Three weeks before, Vargas had been asleep in her family’s home when ICE agents arrested her father and brother as they were headed out to work. Vargas had been a recipient of President Obama’s Deferred Action for Childhood Arrivals, which gave her a two-year protection from deportation, but her status had lapsed because the $495 renewal application fee was prohibitively expensive for her. Fearing for her own safety, Vargas refused to let ICE enter the family home and barricaded herself in a closet, where she and ICE agents began a five-hour standoff. ICE eventually broke into her home, but backed off when she convinced them that she was a DACA recipient, though not before promising her that they’d be back for her. Vargas’s release suggests that the Trump administration is more sensitive to public protest than it might admit to. Vargas’s release is a win for immigrants and their advocates, and a twist in the already complex realities of living as a noncitizen in the Trump era. Donald Trump has maintained a hard-line approach to dealing with undocumented immigrants, issuing extreme executive orders, and approving mass raids in his first weeks in office. On the campaign trail Trump repeatedly vowed to dismantle DACA, President Obama’s signature immigrant-relief program. Seven weeks into his whirlwind presidency, he’s still refused to do so. Multiple reports have depicted the Trump administration at odds with itself, uncertain about how to treat this beloved and well-organized constituency. Still, multiple DACA recipients have been arrested in the last few weeks even as Trump has vowed to treat DREAMers who with compassion. Back in January, Trump told ABC News that “They shouldn’t be very worried.” Clearly, it’s not just undocumented immigrants and other noncitizens who are trying to suss this out for themselves. The administration, too, appears to be figuring this out as it goes. On Thursday, ICE took to Twitter to release a string of tweets clearly aimed at DREAMers: “Deferred action does not prevent DHS from executing a removal order,” one read. “Deferred action may be revoked anytime especially when someone commits a crime or poses a national security [or] public safety threat,” read another. ICE and the rest of the Trump administration have offered little to suggest that Vargas’s release on Friday is but a one-off deviation from its larger campaign to pursue undocumented immigrants whom it has cast as criminal threats to US national security. But the Trump administration is perhaps more sensitive to public protest and legal tussles than it might admit to. ICE did not respond to queries for comment.